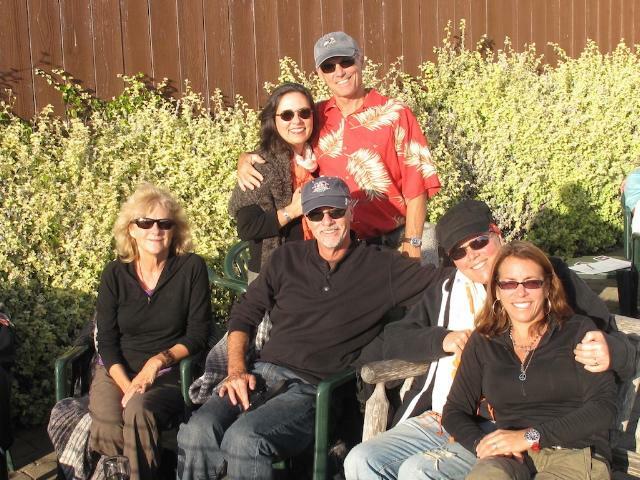 This is the gang that went to Half Moon Bay. I love these guys, my former colleagues at the SJ Mercury News. We plan to retire to a commune together! Seriously, that’s why you haven’t called or visited? I can’t think back to the time that I might have thought of someone like me as a pariah. In fact, cancer has been such a part of my life (my mom, a survivor, diagnosed when I was 5; my dad succumbed four years ago after a 6-year ordeal) that I have a fully developed empathy gene for fellow sufferers. It’s even more developed now, and I’d like to figure out a way to use it for something good in the future. Short and sweet. It can be used for many occasions. Kind of an all-purpose statement of empathy, either spiritual or secular. It means so much to someone on the receiving end to know we’re in your thoughts. The bigger problem is what not to say. We do not want to hear about someone who had the same kind of cancer and didn’t survive. We do not want to hear about botched operations or life-altering complications. We are aware of the risks we face. Nor do we want to hear about someone’s bad experience with some test or drug that looms in our future. You probably mean well, but we are trying to remain positive. If you want to warn us, perhaps suggest that we read all we can before launching down that road. Just don’t give us a bad mental image of what might be to come. We are scared enough already. As I lie in bed alone at home for weeks on end, I know that life goes on for people not directly affected by disease. I am both entertained and saddened by Facebook. I love seeing what friends are up to, and reading their smart takes on current events. Their adventures and musings keep me company all day. Likewise, it’s sometimes hard to see that life goes on in all of its excitement and normalcy while mine seems frozen in time. You are traveling, going out to dinner, frustrated at work, embarking on new adventures, watching a beautiful sunset and I live vicariously through you. But sometimes I scream in my head “How can you be doing these things! Don’t you know I’m all-consumed with saving my life?” Was your frustrating day really that bad? That said, I know in my heart that I’m fighting so that by next year I, too, will be able to again focus on a world that doesn’t involve my infusion schedule. FB connects me to normalcy and reminds me that my life, too, will one day be “normal” again – albeit with an insight into all manner of things I might have lacked before. So while we cancer vixens know “life goes on,” my next tip is this: It’s not cool to use your busy schedule as an excuse for not being in contact. “Hi, I would have called you or visited you sometime over the past three months but I’ve been busy going on vacations (or working or fill in something else).” Ugh. Everyone is busy, OK. We know that. Better not to make contact at all than to remind the person they are not worthy of your precious time. Because truth is, the patient might not have even noticed your absence until you reminded them you were just too darned caught up in your own life to care about theirs. So to my own friends, there is no reading between the lines here. You have been great. More than I could have ever expected or dreamed of. But I realized this week when my administrator finally put a counter on this blog that there are more people reading my cancer ramblings in a week than people I know, and maybe they are looking for insight. I would love to know who is lurking in Russia, France and even Sri Lanka, as Google reported. If you’re a fellow traveler, I wish you well. If you’re a friend or caretaker, I wish you strength. To the rest of you… Please don’t let not having words keep you from reaching out to a friend in need. If you can’t find words, a hug works even better. Very well put….when I lost my 18 year old brother to a drunk driver I learned a good life lesson. Reach out and love !!!!! Everyone told me much after his death that they didnt know what to say……your words in the blog speak volumes !!!!!!! I’ve been following your blog … Feel a (gentle) hug from NYC. I think you just made a huge impact on those you have been baffled, scared, flummoxed on what to say and when to say it to anyone who is struggling with illness. Thank you. You are payin’ it forward, dearest Tracie. We love you!! As always, you know just what to say and how to say it! I don’t know what skills I’d bring, but I’d love to be part of the retirement commune! Noone is too busy to text or email or FB a quick “hi, was thinking of ya”…that’s all it takes sometimes. Rock on Tracie Cone. Honest and real…exactly why I love being your friend through this and always. This cancer may have you down and out but you’re one hell of a warrior to lay it out like that. This is why you are so good at what you do Tracie. I love the way you write!!! I look forward to reading more of your thoughts and your day to day fight. Pretty soon, I’m sure I’ll be reading a book all about your experience and how we all can learn from it. You are an inspiration and I admire your strength and honesty. The same goes for Michelle! She also deserves kudos!!!! Sending you lots of hugs!!!! Hi Tracie, it’s been a long time since we talked. I’ve kept up with your interesting life through my mom talking to your mom. I was sorry to hear about your situation. The history that I’ve recieved from my mother about you tells me that you will meet the battle head on and fight untill it’s won. My prayers and best wishes are with you. I remember the good times we had when we would visit Ed and Francis. Swimming in your pool and hanging out with you and your friends. You always made me feel welcome. I wish you a speedy recovery and send my love and hugs! !